Coffee.org,online at Coffee.org, is your destination for wholesale coffee and other specialty products. 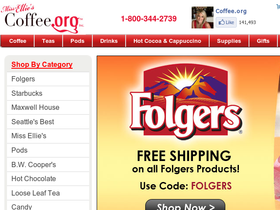 Coffee.org sells coffee beans, coffee makers, coffee pods, ground coffee, and coffee cakes. Coffee.org also carries tea including: Earl Grey, Chai Tea, English Breakfast, Lipton, and Organic Tea Pods as well as hot chocolate, Nestea, Crystal Light, and Cappuccino. Coffee.org also offers gift baskets filled with coffee and coffee cake, soup, and gourmet tidbits. RetailSteal.com has the best Coffee.org coupon codes, Coffee.org discounts, Coffee.org coupons, and Coffee.org promo codes. Shipping and handling rates at Coffee.org depend on the pricing of your purchase and your shipping destination. Free shipping is offered for orders over $75. See website for full details, exclusions may apply. Save 10% on all orders using the coupon code online at Coffee.org. Click to save. Save 5% on any order using the coupon code at Coffee.org. Click to shop. Get free shipping on orders over $75 online at Coffee.org. Click to shop. Check out the clearance section at Coffee.org and enjoy up to 70% savings a wide selection of gourmet coffee and coffee accessories. Save up to 32% on Starbucks blends when you shop at Coffee.org. Click link to buy. Use this coupon code on Coffee.org to enjoy 50% savings on the Starbucks Pike and Blend. Click to save. Click our link to shop at Coffee.org today and save $40 on Starbucks portion packs when you use our coupon code online. Shop at Coffee.org and enjoy $5 savings with email sign up. Click here to shop.